The nuances of strategy. One of the topics discussed at the recent MARCOM forum which there was great confusion about was the entire concept of marketing strategy. Marketers are genuinely confused at this point about strategy from a company perspective vs. strategy for specific marketing objectives. Marketing and PR must start with strategy. I’ve thought a great deal about strategy and distilled it down to my free two-page Marketing Strategy Planning Template. Marketing Strategy Planning Template (PDF). Developing A Sustainable Strategy With Geoff Livingston. Geoff Livingston just released his sophomore business book, Welcome To The Fifth Estate. His first book, Now Is Gone, was way ahead of the curve in terms of introducing Social Media and Digital Marketing to the greater masses, and his newest book looks at how to create sustainable and powerful Social Media strategies. Geoff also has a passion for making a difference, and it’s that bridge between social causes and Social Media that truly keep him and his company (Zoetica) energized. The Most Undervalued (Or Overlooked) Part of Your Social Strategy. Companies are starting to spend a lot of time, energy, and thought on developing comprehensive social media strategies. The good news is that many of them understand the potential for social to have many integration points throughout their organizations, and are starting to consider more than just marketing or PR as applications for what the entire breadth of social – from listening to engagement to measurement – can do for their business. Advertising Your Blog: Go Viral on a Blogger’s Budget. Until now you’ve been relying on organic methods to grow your blog’s traffic—search engine rankings, guest posts, social media and word of mouth. But now you are thinking about stepping into the league of the the big boys (and girls) and spending some money on advertising your blog to the world. Where do you start? Where do you find the money? How much do you spend? And where? 16 Smarter Ways to Use LinkedIn to Build Your Business. While most people think of LinkedIn as a glorified job search board, this social media site is actually an amazing business-to-business marketing tool. If, that is, you know what you’re doing. With a little bit of time and effort, the following guide can help you turn LinkedIn into a lead generation engine and give you the inside track to generating more business with LinkedIn. A Hammer Isn’t a House – Don’t Confuse Tools with Metrics. It’s terrific that the marketplace is bloated with companies that are offering whiz bang software to listen, respond, measure, and analyze social media. It’s the fanciest bunch of calculators ever devised, and every company in the space tries to differentiate by chopping up the same pile of data in visually compelling ways. But you can’t be seduced by a tool on your quest to effectively measure your social media program. That’s like recognizing that you love mangoes, and becoming a vegetarian as a result. 5 Reasons to Be Authentic Instead of Generic. At first I wondered why anybody would be interested in hearing about the little snippets of my life, and what I have learned from my experiences. But after I started writing in my own voice, an amazing thing happened: people started to respond. I haven’t been blogging long, but I have already learned how to blog better. Here are five good reasons why you, too, should aim to be authentic instead of generic. Don’t Influence, Connect And Build Trust. Many continue an unhealthy obsession with influence. Except the web isn’t really about influence. It never was. The mere fact so many use influence as jargon of choice to define their web startups which tout ability to show “how important” someone is shows a lack of comprehension of the nature of web communities. Ask me how important seeking out specific influencers was when building niche-specific blogs to 5-figure subscribers, when creating 6-figure Facebook / platform-specific pages from the ground up and creating viral campaigns that spread 100% organically. Not…at…all. 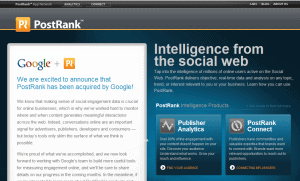 Google Acquires Postrank: A Fork in the Road for the Future of Social Media. One of my favorite startups in the world, Postrank, has been acquired by Google. Here at ReadWriteWeb we use Postrank every day and if Google shuts it down I am going to be sick. New account creation has already been shut off and a shell of the technology is most likely to become a part of Google Analytics. Next story How to Go Mobile on WordPress!